By using LIKE query we can match part of the full data present in a column. Here our search word need not exactly match. Using Like Query with wildcard in different combinations, we can match our keyword with the pattern of the data present in columns. The best way to use LIKE command is to apply it in a text or varchar field along with wildcard % or _ . We will apply the LIKE command here like this to our name field. The above result shows that we will get all the names where John word is present in the record. It can be any where. Please note the use of symbol % in the query. This will match any number of character even zero character before or after the word John. So we are getting the names those starts with John also. We may require the names which only starts with John not inside the name. In other words we want records starting with John only. In this case we will remove the use of % at the left of word John. 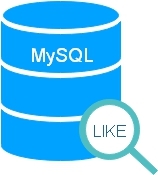 Here is the SQL with LIKE command. The above result have desired word John at the end only. We can use underscore as wildcard for one character space and use them along with Like statement and apply to fields. For example we want to collect all the account numbers ending with 044 in a five digit account number field. Here is the query for this. We have used two underscores in our query to tell that first two digits can be any thing and it should end with 044. Underscores as wildcard can be used at any location but one can replace one character only. We can use more than one underscore also inside our query. This way we can use LIKE command with many other commands to get desired output. As we have seen all the above cases are case insensitive. To match lower only or upper only cases we have to use binary command to make binary matching. Here is an example. Try the same query by not using binary inside it. Find all courses from the Section table that start with the character, �C�, but do not have �h�, as the second character. Same way the query can be extended to search across more than two columns. All above queries can be used by using PHP script. First the Script should connect to MySQL database and then records can be displayed. @manoj - This is how your command should be: "Select * from tblcountry where country like '%" Textbox1.Text "%'" OR you could also remove the "%" before the Textbox1.Text or remove it after, it will depend on your usage. Hope this helps. How will i get names of all those people who have the string 'in' in their names? I need to find a specific literal in an Oracle table column which is described as a "long" datatype. How do I do this, since "like" command can't be used on "long" type columns (can't use "long" column in a where clause of a select statement)? I get the error message:"inconsistent datatypes: expected NUMBER got LONG". Please help! Hi...! The information is useful. I need somehelp. I want to get the information like SELECT * FROM employee WHERE name LIKE '%ram' where '%ram' is the value of other table which is similar to the value in the current table. Means i need to retrieve the information from the current table based up on the value of other table. Can you help how to acheive this .....? You can run two like commands by using AND or OR combinations. Try by printing the SQL to see what the value of category you are getting. You can also print the error message to see what has gone wrong. Like not working in vb 6.... please help code: Me.Data1.RecordSource = "select * from phone where name LIKE '% " Me.Text1.Text "%'" Me.Data1.Refresh all >,<,>=,<=,and,or,between etc works correctly but like not working..... what can i do? what if i would like to find person's name which contain 2 words only? Hi, I am having the table with the column First Name. Where ever the first name contains 'is' I just wanted to remove these word in that record. hi, pls how do i write a query that should give me a result for all last_names that start with J, A and M? Hi, can you please tell me how to retrieve names that are starting from either A or B from names table? I want to print one field that should not start with the digits. How can i write that logic using the NOT LIKE keyword. or is there any otehr comand can we use. pls answer this question. Hello Every0ne: I Want To See The Third Letter In Name ..... In MySql Whos Could I ? have a column named Name.I want to make a query where i just enter initials of any name and i get the full name.Plz solve my problem. Very simple and helpful.I have been benefited from here massively.Thanks a lot. Hi, If I have the second table like Student.Table but the First part of name or Second Part of name in the name field, Now guide how to compare both the table, My database is a huge one near about 1million record. I am trying to find a string at the end of a field using %XYZ as my search criteria. How do I condition the LIKE operator not to consider trailing blanks? I saw some information on the strip BIF but am not familiar with it (novice using SQL). Hi, I was create table with 3 columns and insert data, by using SELECT QUERY i get all the 3rd column data, from that i want particular column data. what can i do for that. if any body knows plz update. Thanks in advance. how can i get a data from a table where it should be match with its username. all i want is when i type the username in a textbox and click a command button, the password will be on the other textbox that correspond to the username. How to display the names that end with a particular letter in sql? Please tell me how to find a particular one employer salary in mysql table. for example find second employer salary. my problem is i dont understand in sql statement with jquery & ajax... what am i do?? plz help me>>???? thanks for solved my problem...i realy thankyu for ur advice..and now i m doing every thing in sql n jquery..because u r amazing...!!!! search name with third letter. how to get answer "list the name from student whose name start with 'J' or end with 'N'. Find all courses from the Section table that start with the character, “C”, but do not have “h”, as the second character. Select Name of the person from the tables where Name should contains letter 'a' and 'e' ? Kindly let me know the syntax for the below question. Select Name from tables where Name should contains letter "a" and "e". Please note the provided letters are just an example. I need the list of names from a student relation which ends with a particular character say 'a' or a pattern say 'ram' . you give an explanation above but it is not working when i try it in sql. Give me explanation regarding it. I have a, b, c, D, e, f alphabet . Your Query part is ok. You need to pass the alphabet to the query through a variable. There are several ways to do it. You can keep hyperlinks with variable passing the alphabet to the page. Now read the variable and pass it to query. You can use drop down list box and on select reload the page with variable. Take care of injection attack here. Is the output of '%E%' and 'E%' is same?? No , '%E%' means it will match presence of E any where. 'E%' means it will match E at the starting of the string. Hey there ! I want a command line that finds all names whose name containing the first character 'N' and the fourth character 'o' and the rest may be of any character.